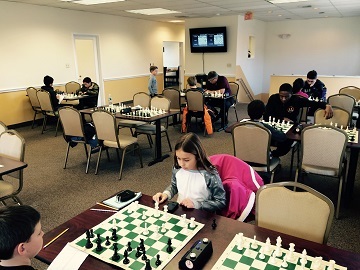 This Saturday’s tournament had four sections. Quad one was dominated by SM Nicolas Checa with a perfect score. CCFC newcomer Jessica Rattray tied for first place with Liam Kaufman in quad two. The third quad resulted in a 3-way tie between Brent McCreesh, Thomas Ewald, and Carl Scovens. Former dream teamer Isabella Hall returns to take first place with a 2.5/3 score. Tune in next Saturday for more G/45 action.